In bringing Alphabear to PC and Mac, developer Spry Fox made a lot of smart changes to make this mobile game feel at home on computers. Like the nerd I am, my favorite is the dictionary. Alphabear is a word game about making large bears. You add cute, animated bears to your field of play by spelling words from provided letters Letters are cleared once you use them. Your bears grow vertically and horizontally to fill the empty space. It’s adorable, and a good use of your Scrabble skills. In the PC and Mac version, there are no longer cooldown timers for different kinds of bears, which means no need to pay real money for powerups to nullify them. It’s just word games all the time, baby, with more kinds of boards for this version specifically. But the change that delighted me most was that they added a live dictionary that defines all the words you spell. For games like Alphabear, knowing a lot of weird, short words can be a huge boost. Remembering that “Fe” counts as a word when the chips are down can save your score. Learning where these words come from and what they mean is really amusing. In all my years learning obscure words solely for the purpose of word games I’ve never actually cared about their definition. The next time I play “Thane,” I’ll know. 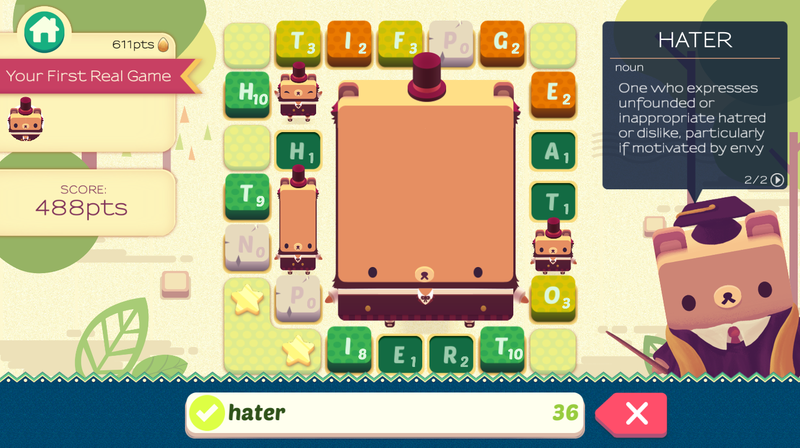 Alphabear doesn’t feel like edutainment; learning new words is just a weird side benefit. But it’s kinda too bad I’m not studying for the SATs.